Some will be quick to point out that the GMC Yukon XL is the same as a Chevy Suburban. They’re not totally wrong considering they’re both owned and made by General Motors and both built in the same assembly line in Arlington, Texas. The Yukon XL shares a similar history with the Suburban, and was actually called such when GMC rolled it out in 1937, just two years after the Chevy Suburban came on the scene. These ran in parallel until GMC rebranded it and introduced the Yukon XL nameplate for the 2000 model year. They’re similar in size, styling and offering of extras (though, it varies on what features are included in any given trim and what needs to be purchased separately). The main difference? Are you towing more often than not? If so, then the Yukon is probably the way to go. Ironically, for our testing, we had the Chevy Suburban for when we were towing an Airstream Trailer (albeit their small version, the Basecamp). And for our GMC Yukon XL test we drove from Boulder to Snowmass to go skiing but did not have a trailer to tow. Still, the internal space was hugely appreciated for getting all of our ski gear (if you’ve been following these reviews, you already know we’re a family of four with two kids under four years old—that equates to a good amount of gear). 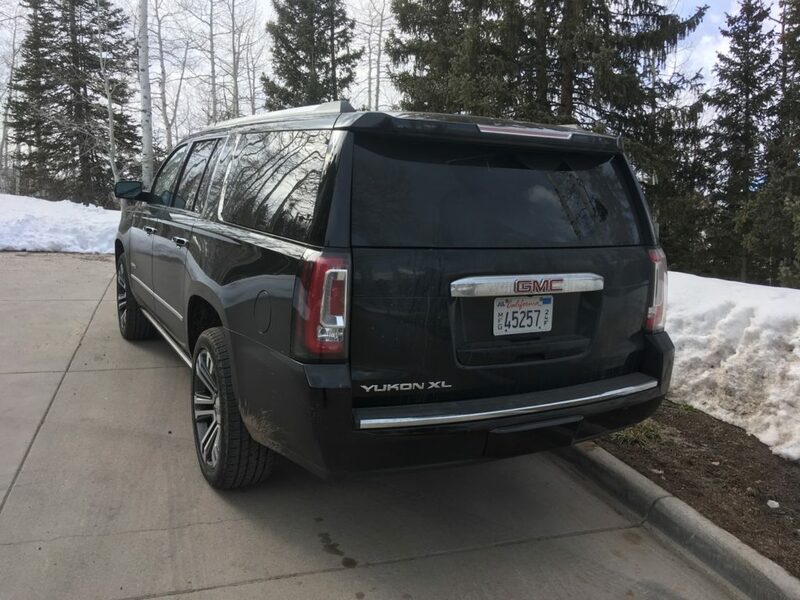 In another bout of irony, we also got to test drive the GMC Yukon XL on a visit to Jackson, Wyoming, but this time it was just my wife and me so we had way more room than we needed. 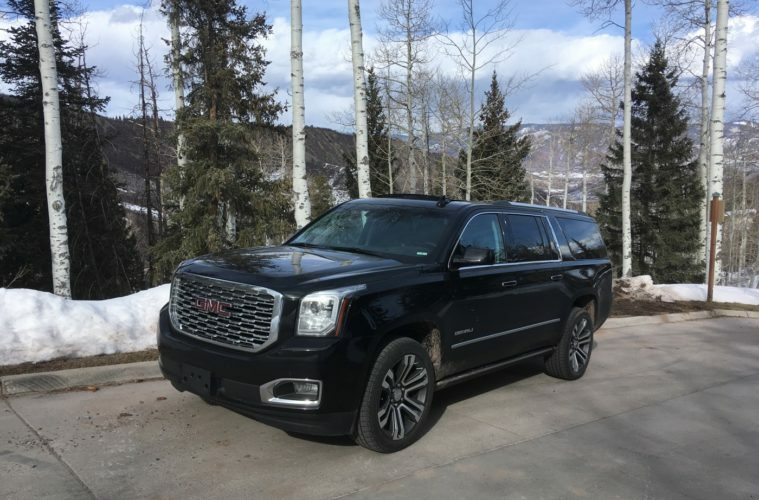 For the ski trip in Colorado we were in the all black 2018 GMC Yukon XL Denali – 4WD with the 6.2L V8 EcoTec3 Engine and 10-speed automatic transmission. As driven, this vehicle priced at $80,190. The starting price for the 2019 Yukon XL, the SLE trim, is $52,200. With the same dimensions as the Suburban, this is a large vehicle—80 inches (6’ 8”) wide and 224 inches (18’ 8”) long. So, it takes some getting used to when you first get in and start driving around. And with a 43-foot turning circle you’ll want to think about maneuvering in tight spaces before getting stuck or finding yourself in an 100-point turn to get going the other way. But that’s to be expected of such a large vehicle. Naturally, the open road is where it feels most comfortable but you never forget how big it is thanks to the spacious interior—ideal for long road trips where the driver and passengers alike can stretch out, sprawl, lean, recline and be comfortable for hours on end. The ride is extremely comfortable as well thanks to the independent coil-over-shock front suspension and solid axle five-link coil springs in the rear, both with GM’s Magnetic Ride Control. Steering is easy with standard electronic assisted power steering on a rack and pinion system and is intuitive—meaning, it’s not too loose such as to need to crank the wheel over endlessly for sharper turns and also not twitchy for more subtle maneuvers. Braking is smooth even on slippery surfaces. 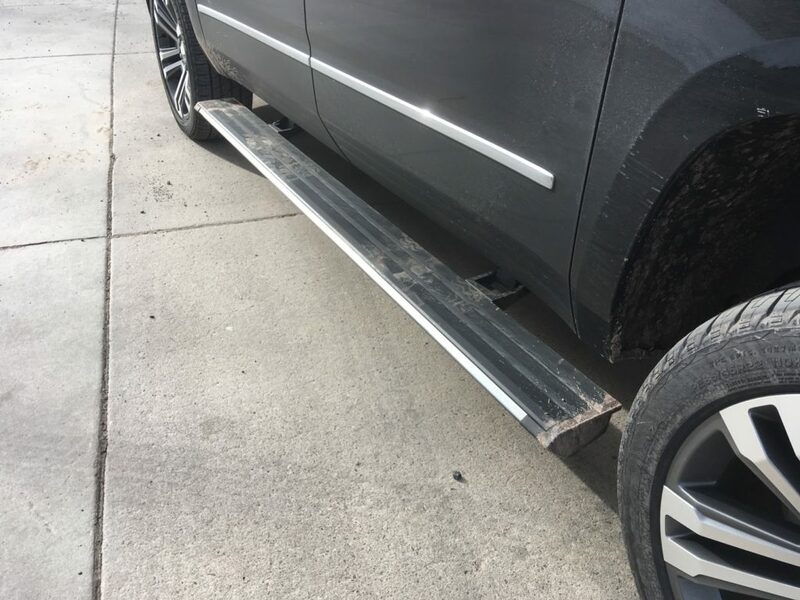 Another aspect that takes some getting used to is being aware of how large the vehicle is for backing up and being able to see potential hazards. Like most modern vehicles today, the GMC Yukon XL is covered in sensors to help provide warnings when getting close to bump into something and the external cameras provide the extra confidence you’re not going to hit someone or something in a busy parking lot. But according to a test by Car and Driver, the GMC Yukon XL takes second place for forward visibility and fourth place (without use of cameras or sensors) for both rear visibility and obscured roadway visibility. With nearly eight inches of ground clearance, the Yukon XL is on the higher end of many SUV’s and that means, with the 4×4 drive, it does indeed have some solid off-road chops for accessing more remote locations without worry, including unplowed roads. As mentioned above, this is where the GMC Yukon XL excels. Along with generous head room and leg space, the GMC Yukon XL sports 39.3 cubic feet of dedicated cargo space behind the third row. That’s more than double the dedicated cargo space in the 2018 Toyota Land Cruiser or the 2018 Honda Pilot. Dropping the third row down the space in the GMC Yukon XL bumps to 76.7 cubic feet and with all the back seats down a cavernous 121.7 cubic feet become available. 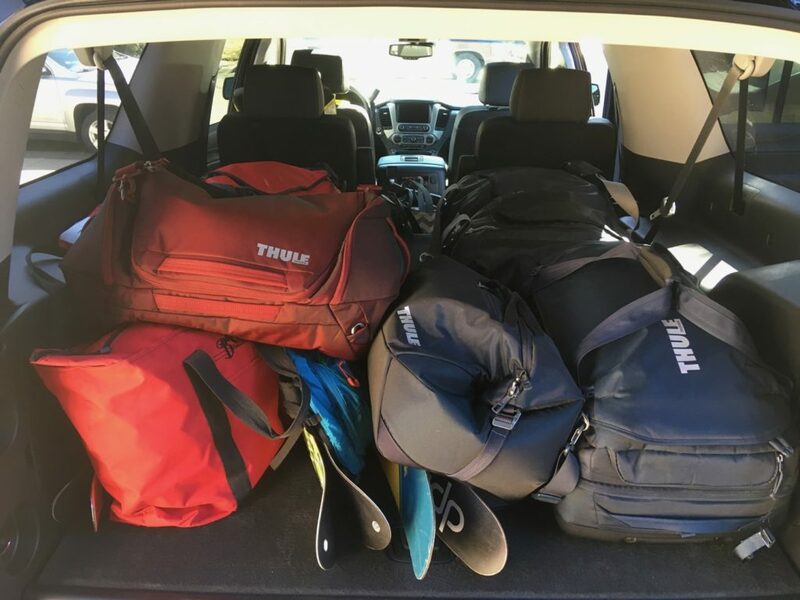 With only four of us, we could make use of the 76.7 cubic feet and that meant we could pack our skis, bags of in-town and ski clothes plus all the other stuff that comes with toting tots along. And we never had to obscure the view out the rear window. With all the seats up, our test model seats seven but bench seat options for the first two rows will accomodate nine. With the big 6.2L V8 EcoTec3 Engine, the GMC Yukon XL provides 420 horsepower to tow up to 8,000 pounds—putting large (~35 foot) RV trailers easily within the Yukon XL’s ability. Naturally, gas mileage and acceleration will diminish as bigger trailers are drawn, but the option is there. With rigs this big it seems gas mileage might as well be written off. But that’s what’s impressive about the Yukon XL. It’s EPA rating is 13 mpg in the city and 21 on the highway. In the nearly 500 miles we put on the XL we averaged 19 mpg. That’s going up and over a few mountain passes, hauling ski gear and not being particularly concerned with getting the best possible mileage. Just regular driving. Not impressed? That’s where many smaller SUV’s fall but for those smaller SUV’s to carry the same amount of stuff (not considering towing) you have to add a roof top box and that will cause a major hit to their mileage dropping them well below the GMC Yukon XL. Is that hauling space and gas savings worth the extra bucks to buy the XL instead of buying a box and paying the extra gas costs when using it? That depends on how often you haul that much stuff. Not to mention, with a 31 gallon gas tank, we nearly made it those 500 miles on just one tank. The top of the line Denali trim of the GMC Yukon XL means just about every bell and whistle was included in our test vehicle. 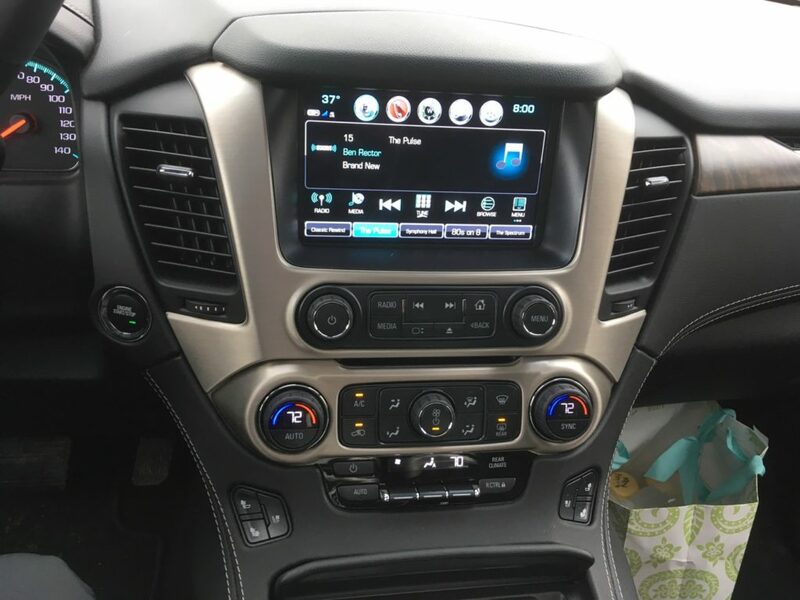 As mentioned in our other GM vehicle reviews, their built in WiFi hotspot continued to prove a very valuable feature for a family of travel writers on the go. The front passenger seat, along with the built in 110v inverter behind the center console, turns into a nice little office while on the road with the beautiful scenery of the Colorado Rockies whizzing by. 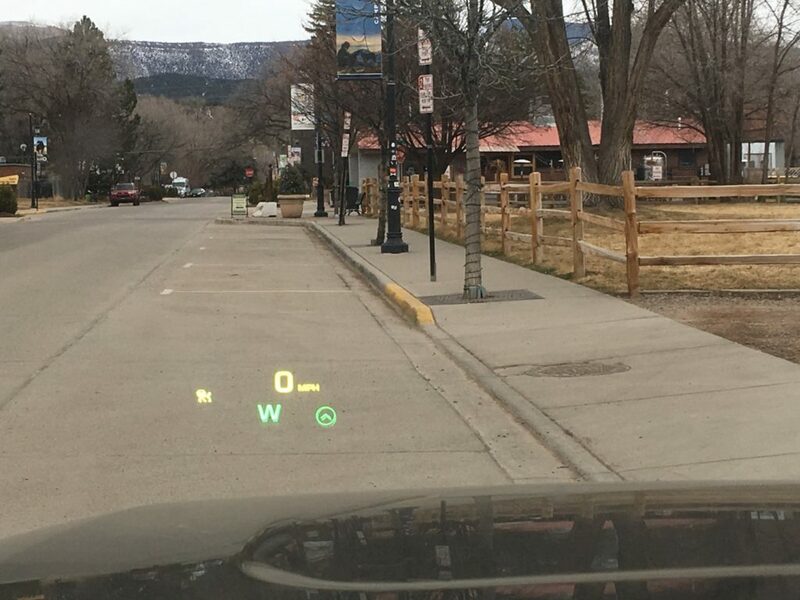 Another slick feature, not exclusive to the GMC Yukon XL is the head up display (HUD) for basic information like vehicle speed and direction of travel. It’s projected right onto the lower portion of the windshield and can be moved a little to get it in the best place for different height drivers. It does get washed out when wearing polarized sunglasses. 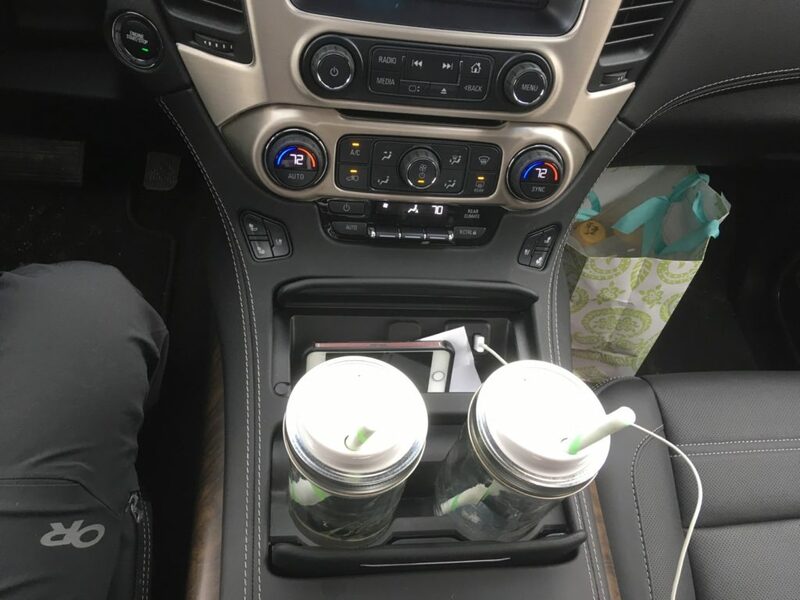 GMC has also done well with the measure on how people are quick to judge vehicles: cup holders. They are generous in size, well placed and there are plenty of them throughout the vehicle. Our testers in the second row couldn’t really appreciate them considering they’re still in car seats, but we did some checking before putting those seats in and they worked great. We also got a chance to rid in the second and third rows for our little testing trip in Jackson. 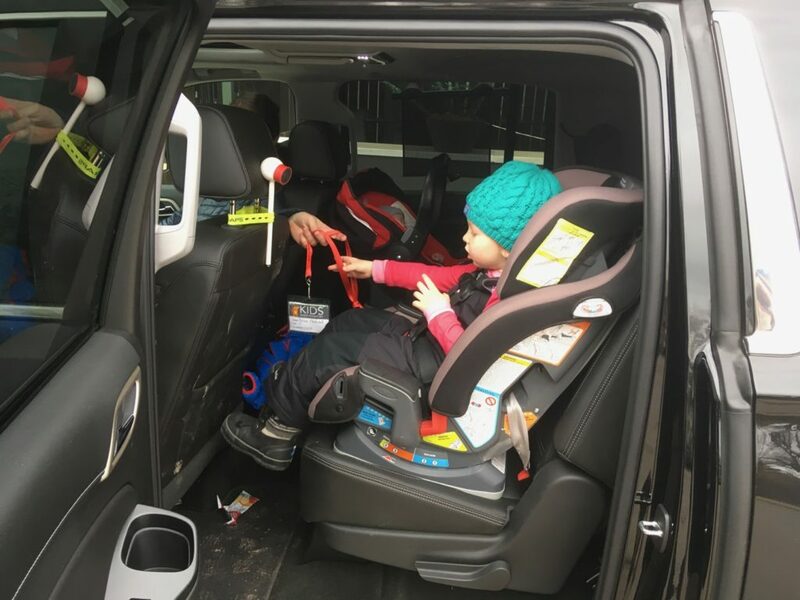 We also appreciated the folding running boards that made it easy for our little tester to get herself up and in the vehicle. As mentioned above the room in the Yukon XL is luxurious and really, best in class for those in the front row. According to Car and Driver, only GM’s own Cadillac Escalade Platinum matches the space to sprawl with the Nissan Armada Platinum close behind. Second and third row passengers don’t get quite the best in class treatment, but it’s still up there. The Yukon XL also scored well for dampening external noise to make the ride more comfortable on the ears. Only the Mercedes-Benz GLS450 4Matic was quieter on the interior while driving at 70 mph. Like the Chevy Suburban, the GMC Yukon XL is right up there as one of the best possible family vehicles. It may feel a little obnoxiously big for running errands around town, but even if this is the only family vehicle, drivers will get used to its size and will adjust how they drive accordingly. But the option of being able to throw friends in or easily convert the cargo space to take on bigger loads at the same or, relatively speaking, better gas mileage than smaller SUV’s dropping the extra coin on the Yukon XL from the start could easily pay off in the form of improved convenience.